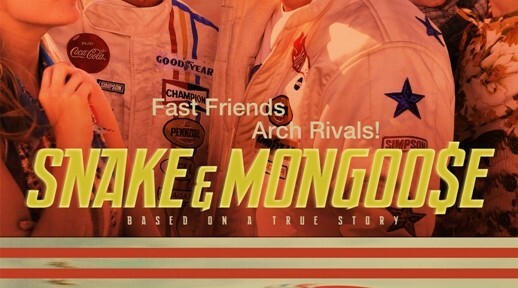 If you are an avid drag race fan or into the historical vintage racing stuff, you’ll enjoy watching the upcoming movie, Snake and Mongoo$e. It will be coming to theaters in limited release after the NHRA’s US Nationals being held this Labor Day Weekend. In a clever marketing ploy, it is first being released in markets where the NHRA hosts drag racing. It even had some special preview showings during Hot August Nights and the Woodward Cruise, according to screenwriter and co-producer Alan Paradise. We had first covered this movie this month. Some of you may recall when Don “the Snake” Prudhome and Tom “the Mongoose” McEwen barnstormed the country with their drag racing grudge matches. Their profiles blossomed when Mattel’s Hot Wheels sponsored the racers, crafting a set of drag racing themed models. This is generally regarded as the first non-automotive related sponsorship of an automobile racing event. Guess you can trace the naming of stadiums, sponsorship of pro team press conferences and ads at courtside of basketball games, all to Mattel and this duo. 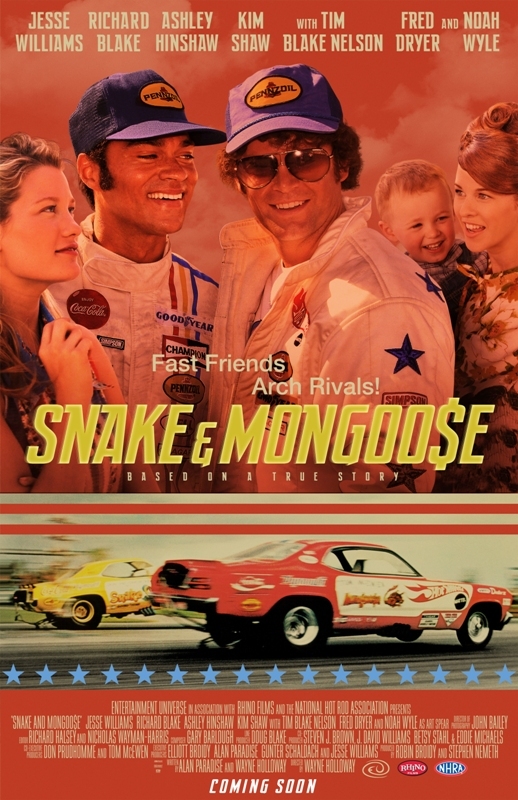 The movie offers a trip back to 1970 when these two raced their cars; Prudhome drove a yellow Plymouth ‘Cuda while McEwen piloted the red Dodge Duster. They used color matching car haulers that kept the cars exposed and visible as they crisscrossed the highways. Now these restored race cars are again barnstorming the country to promote the movie before they are scheduled to be sold in January, 2014 at the Barrett-Jackson Car Auction in Scottsdale, Arizona. We had the chance for an interview with the screenwriter Alan Paradise recently, who offered some behind the scenes insights to this movie. Turns out that Paradise is a prolific writer and has authored a variety of car themed books and worked on numerous car magazines over the years. You’ve probably read his words while working for Buckaroo Publications, Truckin’ and Sport Compact Car. As a filmmaker, he developed over 100 video profiles of NASCAR racers and tracks. Paradise was first approached by Mattel in 2005 seeking his help in producing a documentary on the then 35th anniversary of the drag racing partnership. The documentary “Once Upon A Wheel” was the result and was used initially for Mattel functions and eventually Tom McEwen acquired the rights to the film and even still sells it today. 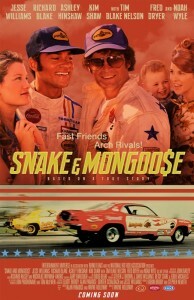 While collaborating on the documentary, McEwen suggested that Paradise could make the story of Snake and Mongoose into a book. That started Paradise off on a trek involving hundreds of hours of research and interviews with some of drag racing’s legends including John Force, Tommy Ivo and Roland DeLong. The more Paradise worked on the project, the more he was convinced that the story needed to be told on the big screen as a movie; and encouraged by his wife, that was the route he pursued. He linked up with Stephen Nemeth of Rhino Films and he started working on a script. It took Paradise seven months to write his first draft and then another 3 months for a re-write, plus another 2 months on final tweaks and changes. Paradise submitted his script to the Hollywood powers late on a Friday, thinking that he could relax over the weekend before hearing back from the producers at the earliest on Monday. Instead on Sunday, he was in deep discussions with the movie folks who had loved the script and read it right away. As they sought out financial backing for the film, some distributors were concerned that the story would not have much attraction in the foreign markets. This seems ironic since drag racing is truly an international sport with strong interest across the globe. So the movie folks opted to go the independent route. During the movie making process, the producers had access to some archival footage from NHRA and were even offered scenes from private collectors. Several vintage racers can also be seen in the movie including the Greer Black Prudhome dragster. The movie was able to use numerous scenes after colorizing and cleaning up these films. So when you see races, you know they are the real deal. And for the real deal during the race scenes, obviously the movie actors couldn’t be behind the wheel. Taking the place of Richard Blake who portrayed Tom McEwen was Trevor Larkin, the son of famed drag racer Tommy Larkin. And guess who drove for Don Prudhome’s character?Â Yep, Don Prudhome piloted the drag car himself instead of actor Jesse Williams. The actual filming of this epic took seven weeks and then came months of post-production work. A short snippet was shown at the 2012 SEMA show in Las Vegas and it looked terrific. Can’t wait to finally see the full length feature. Once you see it, leave us a note.